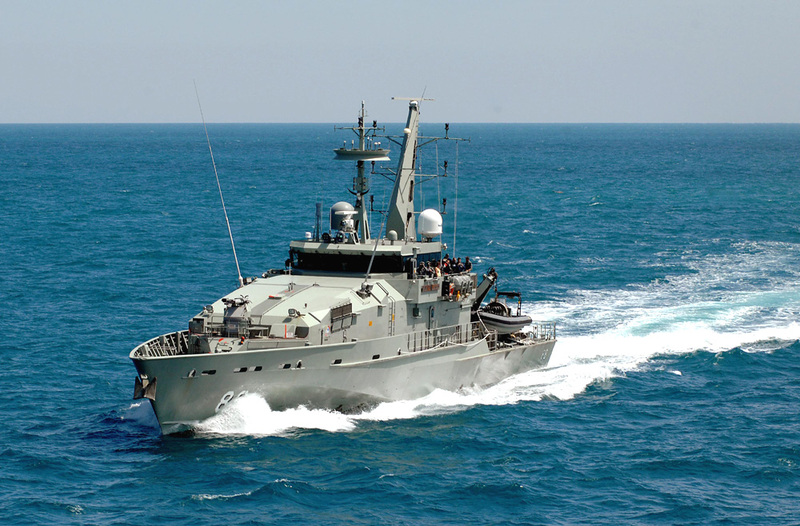 HMAS Maitland and her 12 sister Armidale Class Patrol Boats and two Cape Class Patrol Boats are Navy's principal contribution to the nation's fisheries protection, immigration, customs and drug law enforcement operations. The vessels work hand-in-hand with other Government agencies as part of the Australian Border Force. In the event of war they would be tasked to control the waters close to the Australian mainland. Armidale Class Patrol Boats are highly capable and versatile warships which are able to conduct a wide variety of missions and tasks. Most importantly, Patrols Boats are a primary enabler of the Australian Defence Force contribution to Operation SOVEREIGN BORDERS, which is a whole of government effort to protect Australia's borders and offshore interests. Our operations in association with Border Force, Australian Fisheries and Australian Federal Police protect against unauthorised entry, breaches of customs, immigration and drugs legislation, other illegal activity and in support of law enforcement, preserve the integrity of our national fish-stocks, our marine environment and other natural resources. When protecting our borders, Patrol Boat crews are typically employed on a range of constabulary duties involving tracking, intercepting, stopping and boarding other vessels, and sometimes arresting their crews and seizing cargo. HMAS Maitland has a range of 3,000 nautical miles at 12 knots and a maximum speed of about 25 knots. It is equipped with high-definition navigational radar, high and ultra high frequency communications equipment, gyro compasses and echo sounder. HMAS Maitland is also fitted with a satellite navigation system that enables the ship's position to be determined with great accuracy. The Patrol Boat Group is headquartered in Darwin with vessels home ported in Darwin and Cairns. Life in Australia's tropical North has many advantages with easy access to Asia for leave, stunning National Parks, including Kakadu and Litchfield, just outside Darwin, a great outdoor lifestyle, camping, fishing, water sports and 4WD opportunities. There are also numerous cultural and artistic events, including festivals. Although in Darwin the cost of living is a little higher than elsewhere in Australia, this is compensated for by District Allowance. There are also travel allowances for RAN members and their dependants. The region is monsoonal, and is characterised by two seasons - a wet season from late December until the end of April, and a dry season from May to December. Temperatures are warm all the year round, but the dry season is cooler at night and much less humid than the wet. The transition between the dry and the wet, between October and December, is a time of increasing humidity and rainfall, and is referred to as the build-up. The cyclone season runs from 1 November to 30 April each year. Defence is dedicated to recognising the very important and valuable role of ADF members and their families in the achievement of the Defence mission. While carrying out their daily tasks, whether here in Australia or deployed overseas on operations, our personnel need to be assured that their families are well cared for and have the support they need. For this reason Defence has tasked the Defence Community Organisation (DCO) to support commanders in looking after the welfare of Defence families. DCO does this by providing a wide range of services that all members and their families can access to help them cope with aspects of the Defence lifestyle.